European equities are set to grind lower on the open as forward looking traders begin to price in the possibility of a US default. Whilst the repercussions of a shutdown didn't seem to worry markets too much initially, the rigid stubbornness from politicians has traders fearing that the same uncompromising mentality will carry over to the debt limit debate. With all the scheduled US economic data delayed and only Eurozone PPI out in Europe, the driver of today's session will be how traders want to position themselves going into the weekend. As the government shutdown entered its third day it continued to put pressure on the markets, with the fast approaching debt ceiling deadline complicating matters even further. Stocks fell broadly on Thursday after a shooting near Capitol Hill rattled the nerves of many. The Dow Jones Industrial Average fell by 137 points (0.9%) in its biggest decline in two weeks, closing below 15,000 for the first time in a month. This pull back came despite US jobless claims data performing better than analysts' predictions. Flat starts are expected in Europe as the political impasse in the US continues to make new heights of stubbornness. The majority of traders are still on the sidelines but, as yesterday's choppy session showed, some weaker hands are getting a little panicky as the shutdown continues. In addition, whilst the overriding opinion is that the shutdown will be short lived, after the US close last night President Obama ramped up the stakes in the blame game. He issued a direct warning to global financial markets that they should be worried about the situation and that a possible default could occur. Despite the President's warning, markets don't seem to be heeding his words and are shrugging them off as political brinkmanship. 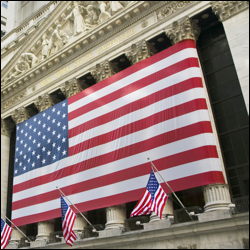 With no truce in sight within the US Congress regarding the federal budget, the equity markets reversed course and headed south. Investors are still digesting the news of the government shutdown, looking for a possible timescale for the current stalemate. The Dow Jones dropped 115 points to 15,210 amid very high odds that the US unemployment report will not be released on Friday. Sorry, there is no indices market commentary for today. Ahead of the US budget deadline, and with no resolution in sight, the Dow Jones opened lower yesterday, initially plunging to 15,074 in the process. Nevertheless, the index did manage to recoup some of its early losses, ending just 15 points in the red at 15,161. The deadline has since come and gone and no agreement has been reached, but the financial markets seem to be taking it in their stride this morning. Asian markets managed to trade into positive territory and Europe is also expected to open with modest gains. Following yesterday's knee jerk reaction, markets and are now waiting patiently for someone's resolve to crack as they feel the public backlash. Polls have shown that the Republicans are (just) being perceived as the main antagonists in the battle, but the shutdown is likely to wound the whole political class. Now that we've gone past the deadline, government workers are having their paycheques stopped and Washington's incompetence is having real consequences on the man in the street. As a result, it will be slightly easier for one side to compromise 'for the sake of the people' and play at being the hero, so markets are expecting an agreement to be on the horizon soon. Despite their calm demeanour, participants may well retreat to the sidelines just in case one side looks to be maintaining their stubbornness to compromise. In fact, the major concern for traders will be if the shutdown continues until Friday and the Bureau of Labour Statistics has to postpone the main event of the week, the Non-Farm Payrolls. US financial jitters are set to see European equities open sharply lower. The amount of uncertainty coming from the other side of the Atlantic seems likely to overwhelm those last few bulls who were hanging around on the off chance that the US might come up with a clear, concise plan of action. However, we've been in this knife-edge situation several times since 2011 and, whilst the herd is expected to head for the exit, will Tesco sell less bread, BMW less cars or LVMH less handbags? No, it won't impact the economy just yet, and so some traders may take this as an opportunity to snap up a few bargains. Although there's still a day to go, US politicians may let the stalemate go to an actual shutdown in an effort to make an extreme political point. However, it's unlikely that either side would risk the public backlash of an extended shutdown for the mere sake of brinkmanship. The US government's struggle to resolve the debt ceiling issue left many investors nervous ahead of the weekend, with the Dow Jones falling 70 points to close at a two week low of 15,258. This fall was in spite of household spending meeting projections by increasing 0.3% and personal incomes rising by 0.4%. More volatility is expected ahead of Monday afternoon's Senate meeting and the US government is running out of time to avert a shutdown of government services.